There are probably a thousand reasons why you should keep a loaf of cocktail rye bread stashed in your freezer, and this recipe is now one of them. 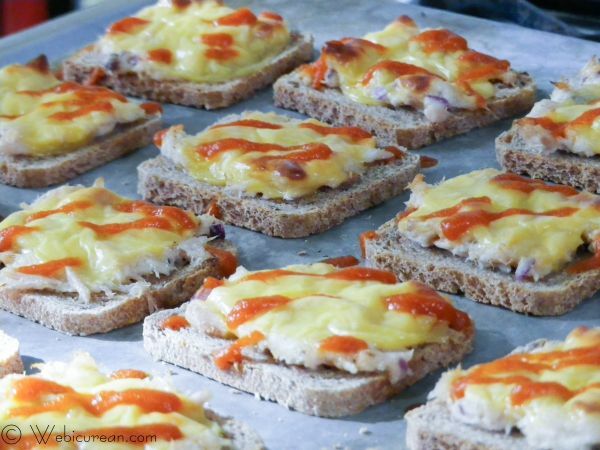 When I was in high school, open-faced tuna melts were a favorite after school snack for me and my friends. There’s something about the hot bubbly tuna and melted cheese nestled atop a crisped up slice of sourdough that’s, I don’t know …Â oh so good and satisfying. While trying to come up with an easy appetizer for Superbowl Sunday it dawned onÂ me — why not make mini open-faced tuna melts? Since I don’t actually follow my own advice and keep the cocktail rye on hand, off to the store I went. I quickly whipped up a batch when I returned and declared this appetizer a winner. It’s definitely something that can be thrown together at a moment’s notice, and it has that homey, comfort food appeal. With the extra bread and cheese, you can easily make a double batch or go in a totally different direction with these Bacon Cheese Toasts. I know you have bacon lying around somewhere. OK focus. Tuna. Melt. Let’s go. 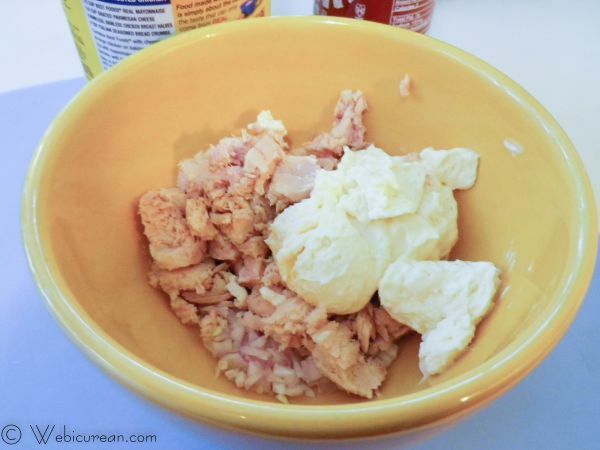 Grab a small bowl, and mix together the tuna, onion, mayo and black pepper. Or, if you alreadyÂ have a favorite tuna salad recipe, use that instead. I promise not to be offended. Place the cocktail rye slices on a cookie sheet. 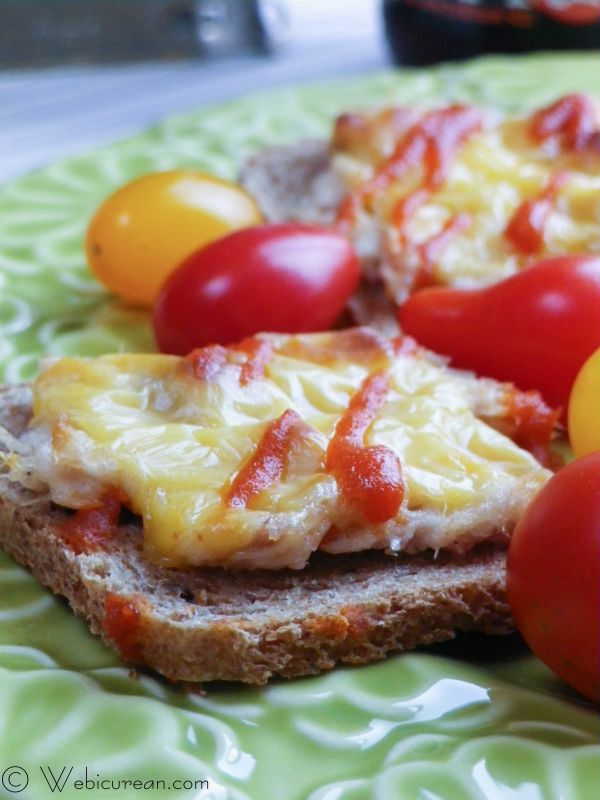 Spread about a teaspoon of tuna on each slice and top with a piece of cheese. Broil until golden and bubbly. Remove from the oven and drizzle with the Sriracha Sauce. Serve immediately. Need some more appetizer ideas? I have five quick and easy appetizers here, including Spiced Pecans, Mini Sweet Potato Frittatas, Sour Cream Dip Florentine, and Pesto Brie en Croute. If you need to feed a big crowd, try my Mom’s Homemade Sausage Mushroom Pizza.Â And check back Sunday for my Mini Crab Bites! All the goodness of a classic tuna melt packed into a bite-sized appetizer. Mix together tuna, mayonnaise, onion and pepper, breaking up the tuna so that there are no large chunks. Place cocktail rye on a baking sheet. 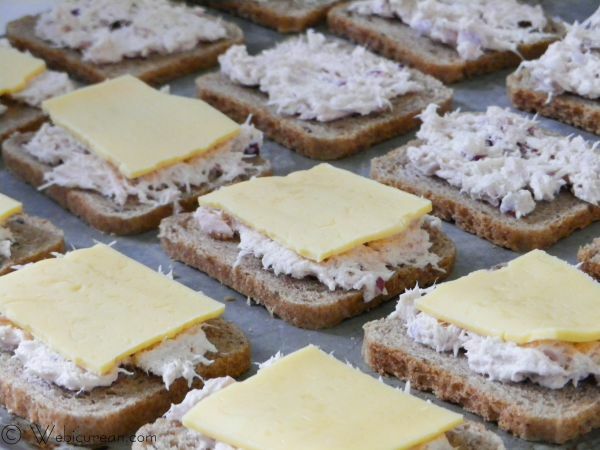 Spread about 1 teaspoon of the tuna mixture onto each slice of bread. Break the cheese into quarters and place slices over the tuna. Drizzle Sriracha sauce over each toast (as much or as little as you want, depending on your heat tolerance). I don’t eat them very often but when I do I love them. I love the added kick you added to it. I will have to add some spice to it next time. I’ve found that Sriracha sauce is good on just about everything!